This exhibition is the second part of a series of art works created by Janice in collaboration with Town Break Stirling, a charity that supports people with dementia and their carers. In 2012, inspired by the University’s dementia development and research work, Macrobert Arts Centre invited Janice to be in residence with Town Break. The ﬁrst residency, although short, had a profound impact on everyone involved. It concluded in the creation of a short dance ﬁlm, which itself has had a powerful reach across the world; challenging perceptions of ageing and dementia. In this second residency Janice has exchanged and collaborated with different people, performers and artists to create a new installation based art work that shares a little of the experience they had together. I’ve been collaborating with the folks of Town Break Day Services every week for 8 weeks. We danced, we laughed, we shared and we talked. I recorded everything. I was keen to capture the sound of people dancing – the energy, the atmosphere, the enthusiasm and the dancing itself. Sound artist Michael John McCarthy has edited this into a sound-loop for you to experience for yourself – either as a moment as you walk through, or for you to linger with and immerse yourself in. You might even be inspired to have a wee dance! (The sound loop last for approximately 12 minutes). The images by Tommy Ga-Ken Wan were taken in Macrobert Arts Centre’s dance studio. We wanted to capture people dancing in the moment and we wanted to share that. With thanks to Town break clients, staff and volunteers: Thelma Anderson, Kirsty Banks, Rona Barton, Jean Bennett, Susie Connell, Aline Faunce, Winnie Goodwin, Christine Hadley, Robin Lang, Alec Leathley, Leslie Marshall, Agnes McDonald, Janet McDonald, Grace MacDonald, Alasdair Morrison, Bridie O’Donnell, Jenny Rejman, James Rose, Alec Tocher, Ivo Todorov, David Whitehead. 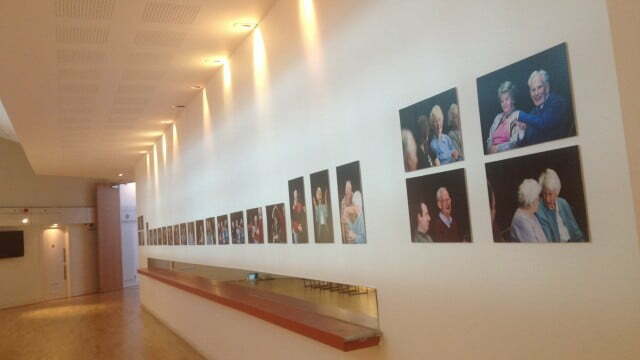 Also Michael John McCarthy; Tommy Ga-Ken Wan; Jo Verrent, Adam Scott, Nicola Denman and all Macrobert Arts Centre staff. Created as part of Macrobert Arts Centre’s outreach activity and Get Scotland Dancing programme, the work is a celebration of the role of dance, music and art in people’s lives. Posted in Choreography, Janice Parker Works, Research & Development Projects, Works and tagged Janice Parker Works.